The University of Southern California is testing a giant 3D printer that could be used to build a whole house in under 24 hours. Professor Behrokh Khoshnevis has designed the giant robot that replaces construction workers with a nozzle on a gantry, this squirts out concrete and can quickly build a home according to a computer pattern. 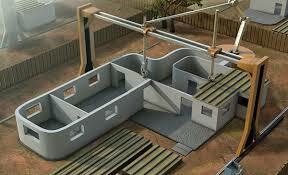 It is “basically scaling up 3D printing to the scale of building,” says Khoshnevis. The technology, known as Contour Crafting, could revolutionise the construction industry.